When we were young there was nothing better than opening up your lunchbox and finding a Little Debbie Oatmeal Creme Pie. These are even better!! We love these soft and chewy oatmeal cookies with vanilla buttercream frosting. 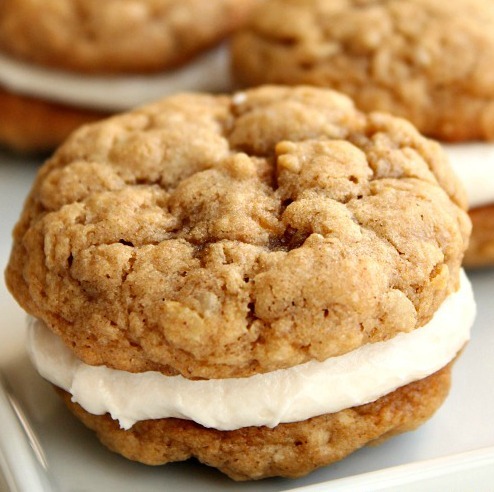 You will love these copycat Little Debbie Oatmeal Creme Pies. So much better than the store bought ones. Cream butter, brown sugar and sugar on medium speed until light and creamy (about 2 minutes). Add eggs, vanilla, and molasses until well combined. In a medium sized bowl combine the flour, baking soda, baking powder, salt, cinnamon, cloves, nutmeg and oatmeal. Whisk these ingredients together well. Slowly add the dry ingredients to the wet ingredients. The dough will be thick. I had to mix it by hand at the end. Roll dough into 1 inch balls. Place on a baking sheet that has been lined with a baking mat or parchment paper. Cook for about 10 minutes until cookies are golden around the edge. Cool on cookie sheet for about 2 minutes then transfer to a wire cooling rack. While the cookies are cooling make the frosting. In a medium bowl beat butter for about 1 minute until creamy. Add powdered sugar, heavy cream, vanilla and salt. Beat on high until smooth and creamy. Spread 1-2 Tablespoons of frosting on the flat side of the cookie, and then top with another cookie to make your oatmeal creme pie sandwich. The recipe doesn't say what temperature you are supposed to bake the cookies. 350 degrees? Thanks for your help! Hi Belinda. So sorry about that. Heat the oven to 375 degrees. I updated the recipe. Thank you! These were absolutely perfect. I made them for my father's birthday, oatmeal being his favorite cookie. He looooooooved them. This recipe is a keeper. Hi Michelle. Thanks for taking a minute to leave a sweet comment on the Oatmeal Creme Pies. We are so glad to hear that your dad liked the cookies. They are some of our favorites. Have a great week!